An awful lot of my friends are moving into new apartments recently. So much so that the past couple meals I’ve had with friends have always been interrupted by contractors or delivery men or designers etc. And normally these calls tend to be rather lengthy so I’ve found myself daydreaming about what my own place would look like when I eventually make that grown up step and move out. First thing I decided was that I must have a decent shower. And on my daily prowl for things to entertain you, I come across the perfect thing. I never thought I’d be one to lust after a shower fixture. After all, lusting after fashion and gadgets already fills my ‘to covet’ quota. But check out the products from Jaclo’s spa collection. 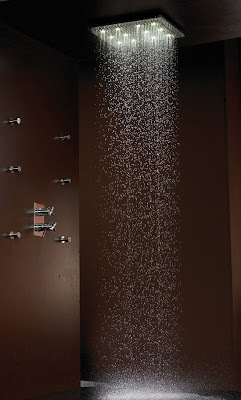 Choose from the Aquavolo Duetto, a stainless steel showerhead fixture that doubles as a waterfall shower and a rain shower, the Circolare spa rain canopy or my favourite, the Dream Light Rain Canopy which features LED lights to illuminate the falling water in white, blue, amber, red, green or warm white hued lights. Why you need to have coloured water, I’m not quite sure. But doesn’t it look pretty? It’d be perfect for those days when you want to belt out that Glee tune, or perform an impromptu rain dance.